Intel Quick Sync Video, built right into the 3rd generation Intel® Core™ processor, uses dedicated media processing to make video creation and conversion faster and easier. With it you can create DVDs or Blu-ray* discs, create and edit 3D videos, convert 2D video files into 3D, and convert video for your portable media player and for uploading to your favorite social networking sites — all in a flash. The name “Quick Sync” refers to the use case of quickly transcoding (“syncing”) a video from, for example, a DVD or Blu-ray Disc to a format appropriate to, for example, a smartphone. Quick Sync was introduced with the Sandy Bridge CPU microarchitecture on 9 January 2011. Quick sync has been praised for being very fast. A benchmark from Tom’s Hardware showed that it could encode a 449 MB, four minute 1080p file to 1024×768 in 22 seconds. The same encoding using only software took 172 seconds. The same encoding took 83 or 86 seconds GPU-assisted, using a NVIDIA GeForce GTX 570 and an AMD Radeon HD 6870 respectively, both of which are contemporary high end GPUs. Unlike video encoding on a general-purpose GPU, Quick Sync is a dedicated hardware core on the processor die. This allows for faster and more power efficient video processing. Quick Sync, like other hardware accelerated video encoding technologies, gives lower quality results than with CPU only encoders. Speed is prioritized over quality. Quick Sync is built into some Sandy Bridge CPUs, but for example not on some low-end Sandy Bridge Pentiums or Celerons. The current generation of Quick Sync supports the H.264/MPEG-4 AVC, VC-1 and H.262/MPEG-2 Part 2 video standards. The Ivy Bridge micro-architecture includes a “next generation” implementation of Quick Sync. Quick Sync was first unveiled at Intel Developer Forum 2010 (13 September) but, according to Tom’s Hardware, Quick Sync had been conceptualized 5 years before that. The older Clarkdale micro-architecture had hardware video decoding support, but no hardware encoding support. 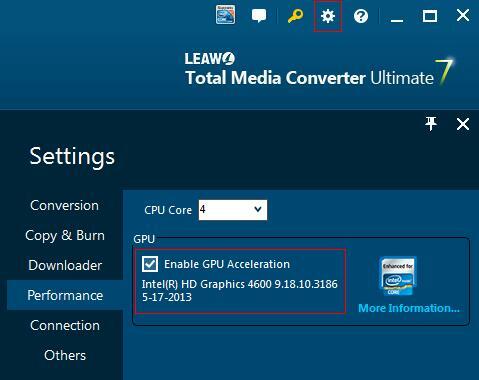 On Leawo’s media converter programs, click “Tools-Options-Conversion” to enter the GPU settings panel. 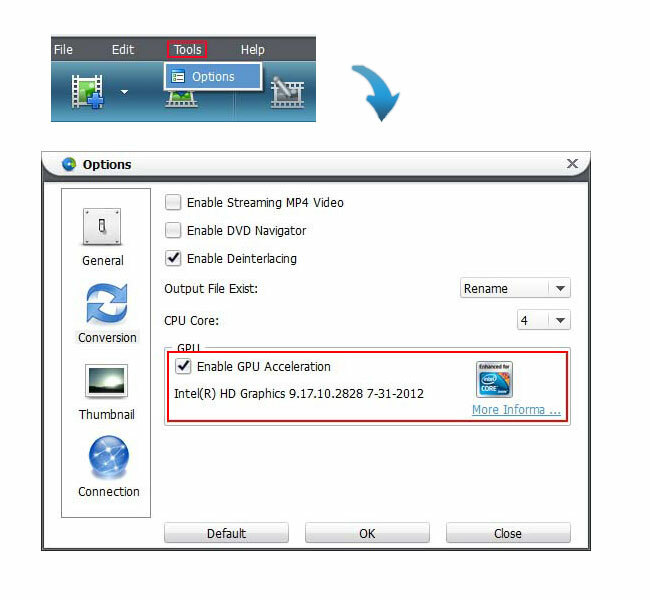 Click “Enable GPU Acceleration” to activate Intel Quick Sync accelerating. On some other Leawo’s media converter apps, you need to click the “Settings” wheel icon on the top right and then go to “Performance” to check “Enable GPU Acceleration” for activating Intel Quick System accelerating. Being Intel Software Partner, Leawo owns the priority of Intel’s advanced technologies and full support of Intel® Developer Zone. Currently, except Leawo Blu-ray to MKV Converter, other Windows products on Leawo all support Intel Quick Sync accelerating.